Continuing regular and routine maintenance on your BMW will tell you a lot about the health of your vehicle. Also, if you are participating in routine maintenance, then you will likely catch many problems before they turn into a pricey mechanical repair. Still, knowing when to replace the radiator hose will often not be the first on your list or the mechanic’s items to check during routine maintenance. The radiator hoses will usually need to be replaced when you begin to experience a leak or flaw in one of the hoses. Still, there are regular times to replace the hose if you want to stay ahead of the problem. If your BMW is over 4 years old or has more than 60,000 miles, then it is a good time to have a trusted mechanic take a look and see if the radiator hose needs to be replaced. If you primarily have highway miles, that is good estimated time frame, but if you frequently drive in stop and go traffic or in a city, then you may want to have the hoses looked at earlier. Why is the Radiator Hose Important? There are usually 2 radiator hoses under the hood of your vehicle. One will connect the thermostat to the top of the engine and the other will most often connect a water pump to the bottom of the engine. The main purpose of the radiator hoses is to ensure the flow of coolant throughout the engine when it is running. This coolant flow will prevent the engine from overheating. There really is only one primary way to know if you need to replace either radiator hose, and that is if the hose is leaking. You will be able to tell you have a leak if there is fluid under the vehicle after it has been parked for any period of time. The radiator hose is made of rubber, and as the vehicle temperature goes from hot to cold on a regular basis, it can cause the hose to break down. The radiator hoses need to be made up of these rubber compounds to avoid breaking with vibration and movement under the hood. With advancement in the technology, the combination of mesh and rubber compounds have made the radiator hoses last much longer than in the past. However, this does not ensure that they won’t ever break down! If you begin to notice a leak and you suspect a radiator hose, this can easily be checked without dismantling any parts under the hood. It is very important that you wait for the vehicle to cool down before you check the hoses, but once they are cooled down, you can look at the hoses to see if there are any visible breaks or tears in the rubber. Be sure to check near where the metal attachments are, because the metal likely causes that part of the hose to reach higher temperatures when the vehicle is running. You can squeeze up and down the hose to see if that reveals any imperfections that were hard to see before. If you notice that there are visible breaks or tears, it is likely that the hose will need to be replaced as soon as possible. 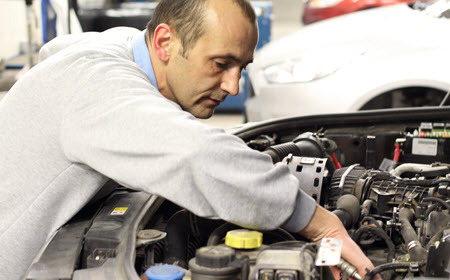 As always, if you are unsure as to what exactly you are looking at or looking for, consult a trusted BMW mechanic to investigate the issue themselves. Depending on where you get your BMW maintenance, the radiator hose may not be a regular priority. You can mention that you’d like them to check the hoses from now on when you come in for maintenance, or if you suspect an issue, let the specialists know so they can take a closer look and diagnose the problem. If you live in or around Dallas, University Park, Highland Park, Irving, or Coppell, Texas, then consider Louden Motorcar Services Inc. as your trusted BMW specialists. If you suspect that you may need to have a radiator hose replaced or just have any questions or concerns, contact Louden Motorcar Services, and we’ll be happy to get your BMW fixed so you can feel safe in your vehicle without worrying about leaks or overheating.